Laguna (ranked 8th) opened game one of the CIF Southern Section Division 1 Elite 8 playoffs against Newport Harbor (ranked 1st) in front of an energetic crowd at Newport Harbor High School last Thursday. The Breakers came out early with the first goal and held the lead most of the game. Going into half, freshman William Kelly wowed the crowd with an outside shot to make the game 5-5. After a strong three quarters, the Breakers lost their momentum late in the 4th and the Sailors came out with the win 9-6. Zach Cord led Laguna Beach with two goals, while James Nolan, Logan McCarroll and Colton Gregory also scored. Junior keeper Caden Capobianco held strong with 12 saves. The Breakers move on to the consolation semifinals against Mater Dei High School (ranked 5th) at 6 p.m. at Mater Dei tonight, Tuesday, Nov 6. The Monarchs lost to Oaks Christian (ranked 4th) in OT 10-9 previously. On Tuesday, Oct 30, City Councilman Steve Dicterow invited Laguna Beach Pack 35 Webelos 2 Den to City Hall. Dicterow organized a tour of the fire department and police department for the 5th graders, before inviting them to sit around the Council table at City Hall. He talked to them about being a government leader and how as citizens they can contribute to their community. He encouraged them to use their individual abilities to make a difference in the world. The Webelos 2 Den is planning a kindness community service project, inspired by Dicterow’s Laguna Kindness Project. From the turnout at the LBHS Cheerleading Clinic on October 13, there are quite a number of future Breaker cheerleaders on the horizon. Two days of intensive (and fun) instruction left the kids with cheerleading knowledge and the anticipation of cheering with the LBHS squad at the football game the following Friday. Future cheerleaders from the ages of kindergarten through eighth grade joined the LBHS cheer squad at the Laguna Beach Cheer Clinic at Dugger Gym. During the clinic, attendees learned chants, cheers, a dance and tie-dyed T-shirts. “I had fun helping the younger girls learn our LBHS cheers. I really enjoyed spending time with them and watching them grow as athletes. I love how happy they were when they were cheering at the game,” says Cheerleader Isabella Lyons, also a sophomore. Parent response was positive as well. “This was my daughter’s first year attending the LBHS Cheer Clinic and she loved every minute! The clinic was very well organized with the nicest staff and the sweetest cheerleaders. It was a Saturday full of fun activities, making memories with old and new friends and learning the cutest cheers to perform at the football game. On game day, they all had a blast being down on the field with the crowd cheering them on. Cheering at the game made her even more excited to be a future Breaker Cheerleader. We had such a great experience and look forward to the next cheer clinic!” says CC Dancey. On the Friday night after the clinic, the kids joined the LBHS cheerleaders on the field for the football game against Ocean View and performed for hundreds of fans in the stands. It was a fun night for all involved, and to top it off, LBHS football team won the game. Dates and details of the next clinic will be published as soon as they are available. Laguna Beach High School Girls Tennis upset 4th seeded Alta Loma in the team’s first CIF rounds on Tuesday. The Breakers’ number one player, Ella Pachel, won 6-2, 6-0. Sarah Maccallum won in three sets 6-2, 6-2, 6-0. Doubles teams won too. Megan Mindte and Vanessa Gee won 2-6, 6-1, 6-1 and Jessa Chaney and Camille Deckey won 6-1, 6-2, 6-1. Kaleigh O’Donnell and Cosette Bastó did their very best but went down 0-6, 4-6, 0-6. LBHS continues today (Friday) with team to be announced. Laguna Beach High School Girls Volleyball (18-12) faces number one seed Village Christian (33-9) at 2 p.m. tomorrow, Saturday, Nov 3 at Cerritos College in the CIF Division 1 Championship game. The Breakers are meeting the Crusaders for the second time this season after losing in a regular season non-league match on September 21 at home (21-25, 25-23, 20-25, 18-25). The two teams also met in 2015 at Village Christian in the IIAA semifinals with the Crusaders winning 25-18, 19-25, 21-25, 25-23, 15-13. The match will streamed live on Fox Sports West. Laguna Beach High School Boys Water Polo advanced to the Elite 8 of the CIF Division 1 Water Polo Finals for the first time since 2005. Laguna Beach (18-10) will meet Surf League winner Newport Harbor (27-1) in Round 1 this Thursday at Newport Harbor High School at 5 p.m. The Breakers have met the Sailors twice this season, falling 11-7 and 8-4, respectively. Laguna is one of three public schools in the Elite 8 bracket and is excited for the challenge and high-level play. Come out support your local boys on Thursday at the pool! LBHS Football capped a truly remarkable regular season on Thursday, defeating league rival Godinez 45-7 on the road. With the win, the team moved to 8-2 on the season, and positioned themselves as one of the top seeds in the CIF Division 12 Playoffs. The team will host Saddleback Valley Christian (3-6) in the first round of the playoffs on Friday at LBHS. The Breakers came out strong scoring fast and early, 14 points in first quarter with 24 points going into the half. 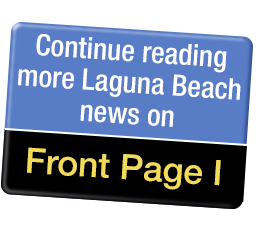 Quarterback Andrew Johnson broke more Laguna Beach High School records, including the single game passing TD record with six TDs on the game, connecting with Shane Lythgoe, Sean Nolan, Kai Ball, Noah Diver and Raul Villalobos in the end zone. He also broke the school’s single season passing yards and completions records. The Breakers defense held Godinez to just 112 total yards with key plays by Sam Tyrell, Caleb Mostajo and interceptions by Sean Nolan and Conner Fink. The Breakers need just four wins to be crowned the CIF Division 12 Champions, starting with this Friday’s home game against Saddleback Valley Christian. Kickoff is at 7 p.m.
Laguna Beach High School Drama invites audiences to a performance of Shakespeare’s Romeo & Juliet at the Laguna Beach High School Artists Theatre beginning this Friday, Nov 2 at 7 p.m. A timeless tale of jealousy, prejudice, betrayal, and true love, Romeo and Juliet try to defy the circumstances that forbid their love, with heartbreaking results. Set in modern day, in the fictional town of Verona, California, where the wealthy families of the two young lovers are locked in a bitter feud, the LBHS production of Romeo & Juliet will feature the work of guest director Michael Irish, a 1999 alumnus of Laguna Beach High School and the Park Avenue Players. Irish has been performing theater, film, and voice-over for over 25 years, appearing in companies such as The Laguna Playhouse, South Coast Repertory, The Chance Theater (where he was a Resident Company Member for five years), Shakespeare By The Sea, The Pearl Theatre, and Allentown Shakespeare, to name a few. “Watching this story unfold over the last two months has been a distinct and unforgettable privilege and joy,” said Director Michael Irish. “These students are fiercely talented and uncommonly brave. The opportunity to share my love of Shakespeare’s works and pay forward what the LBHS Drama gave me, here in my old theater with a new generation of artists, was too priceless to let pass,” he concluded. Tickets are on sale now at lbhs.booktix.com. Tickets are $12 for students and $17/$22 (Premium) for adults. Laguna Beach High School Drama invites audiences to a performance of Shakespeare’s Romeo & Juliet at the Laguna Beach High School Artists Theatre beginning Friday, Nov 2 at 7 p.m. A timeless tale of jealousy, prejudice, betrayal, and true love, Romeo and Juliet try to defy the circumstances that forbid their love, with heartbreaking results.